News Alert: Amazon.com recently announced a new, lowered price for the Kindle, Amazon's wireless reading device. As of the date of this post, it is currently in stock and available for immediate shipment. Visit the Amazon Kindle page for more information and current pricing. A list of about 25 new mystery books scheduled for publication in July 2008 and available for the Kindle has been posted to the Kindle Mysteries website. This month's profiled Kindle title ... Aaron Elkins published his first Gideon Oliver novel in 1982, winning the Edgar Award for Best Novel in 1987 for the 4th in the series, Old Bones, and he's still giving us first rate mysteries featuring the Skeleton Detective. 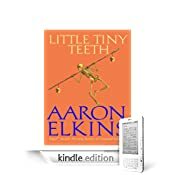 Last year, Little Tiny Bones was published in hardcover and is now available in paperback and for the Kindle. Sailing the Amazon with a group of botanists, "Skeleton Detective" Gideon Oliver is on his dream vacation. But it turns nightmarish when fierce head-hunters narrowly miss killing the group leader, then a deranged passenger kills a botanist and flees. Long-past enmities and resentments—and new ones as well—might explain things. And when a fresh skeleton turns up in the river, Gideon is sure that, in this jungle full of predators, humans may be the deadliest of all. The 15th mystery in the Gideon Oliver series, Uneasy Relations, is being published next month in hardcover. Mystery books for the Kindle are generally priced between $3.99 and $9.99 and can be downloaded immediately. Kindle Mysteries currently has a list of over 300 recently published mystery book titles available on our website with more added every week.